Yesterday was my first time voting at an actual polling station in the general election. Every previous year I wasn’t around to vote and had to cast an absentee ballot. I woke up at 6:00am to make it to the polls before I went to class. I only waited about 45 minutes—I can’t imagine what it was like for people who waited hours. I spent the evening in South Hall on the UC Berkeley campus watching election results come up with classmates. 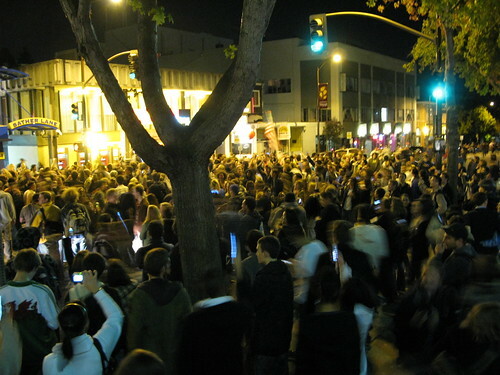 When I left to go home I ran into an impromptu gathering of hundreds of students in the street celebrating. After hanging around for a bit I decided to ride my bike home. As I rode down Bancroft Way I passed wave after wave of people marching up the hill. I happened to have my camera handy and I was able to get this nifty video clip. The shakiness is because it’s hard to ride a bicycle and hold a camera at the same time. No pedestrians were harmed in the making of this film. On a side note: voting in California is hard. By the time we get to the polls we all know which presidential candidate we’re voting for. But how are you voting on Proposition 63? Or Measure HH? I ended up casting 35 separate votes, and people in San Francisco had even more (including some completely ridiculous measures). Wow, looks like quite a night. That didn’t happen in Salt Lake, at lest not near me. I did run into a few upset people the day after. I can’t get over how republican people are in Utah. Favorite quote, “a bad republican is better than a great democrat.” All I can do is shake my head. No matter what, if in your home or in the street, it was a great night. Look at all the idiots who voted for Obama.